The 2006 gardening season has officially begun! Yesterday I about froze my fingertips off while starting two dozen different types of seeds on my handy dandy outdoor potting bench. So what did I plant? All heirlooms, of course, including many seeds that I saved from last year's garden. Ten varieties of tomatoes, two kinds of peppers, eight different lettuces, green & purple sprouting broccoli, giant Italian parsley, and some very old purple cauliflower seeds just for the heck of it (and because I can't bear to throw away old seeds). It's a mere 10 degrees outside this morning. The containers of pepper and tomato seeds are happily curled up next to the wood stove in the living room. Everything else is in the unheated greenhouse. But the sun is out, so they should begin defrosting soon. It's certainly not summer, but I now feel so much closer to a basket full of luscious homegrown tomatoes. I can wait. There are lots more seeds to be started (and ordered! ), and I'll be writing about the goings on in my garden as the season progresses (Update: I now have a kitchen garden blog!). Are you planting an edible garden this year? Why on earth not? Even a few potted herbs on a windowsill will bring you great joy and a wonderfully delicious sense of fulfillment. So what are you waiting for? Let's get growing! For some seed starting tips, please see the comments section of this post. If you only buy one gardening book, I highly recommend The Vegetable Gardener's Bible, especially if you're a beginning gardener. 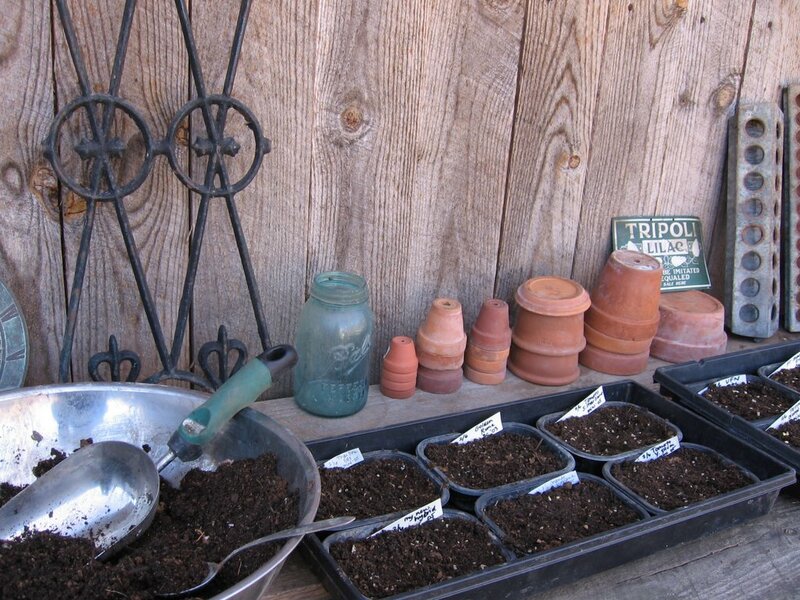 do you make your own starting soil? i did mine for these first seedlings but have much more to start and am looking for more advice. do you use artificial lights? i am worried since we dont have access to artificial light my seedlings wont make it. so many of the authories say you have to have grow lights! can you tell i am a seed starting beginner? this garden will be all heirloom, too- and we hope to start seedsaving. our big goal is to be grocery store free this year. (we buy bulk staples from the local mill & co-op). That sure is impressive FG! I can't wait to see them all sprouted and planted in the garden! Great to hear from you. And congratulations on starting your own seeds--and on your awesome goal to be grocery store free this year. I can't wait to see them all sprouted in the garden, too. It's going to be neat having real photographic documentation of a year in my garden--finally. I started Farmgirl Fare last June, so much of the planting, etc. was already done. I'm excited! I started my seeds this weekend! It was 70 and sunny! Beautiful weather! I'd be interested in your potting soil recipe! I've created my own for the first time (whatever I had available) and I'm praying the seeds will do well in it! I started some heirloom veggies, and this year is my first attempt at herbs (culinary and medicinal)...we'll see how it goes! I can't believe you start seeds when it's still freezing cold! Wow, i've really been spoiled by these San Francisco winters. I run school gardens at urban middle and high schools here. I think my students will LOVE your sheep and llama pictures. This is my first time reading your wonderful blog. Check out our Urban Sprouts blog, too! My goodness you are organized! My husband is the gardener in our family. He collected all of last year's seeds and they are carefully organized in brown paper bags, awaiting the spring season. Collecting and saving all of those the seeds is a very relaxing thing for him to do. After several years of growing heirloom sunflowers, we have zillions (well... nearly) of seeds. I think the best thing is all of the birds they bring. Ooooh, look at the energy and dedication! I looked at my garden yesterday, the daffodils that are about to open and the leafing berries and explained to the plants that it's *february* and way too early for that. Today I venture across the only bridge out of town -- road's closed the regular way -- to do shopping for the next month. I bow in the direction of your hard work. Cranky suggested we go to the nursery today and shop for seeds and seedlings. Something's in the air! You really must have spring fever and a love for home grown food. And home grown food does taste better than much store bought food. I know, I grew up on a farm. Rock on, I'm going to enjoy gardening vicariously through you :) otherwise, woe to the poor plants in my care! OOO... Lots of good questions by Tabitha... I will be interested to read what you have to say about home-made soil mixtures and all the other goodies. I am not so brave to start planting things outside just yet.. we get freezes up until April 15th -- I lost a few plants to a freeze on that day..I will plant after that day. Have a great week Farmgirl. I'm so impressed! I wish I had it together to start spring/summer seeds - and it's 80 degrees here in Los Angeles today! Another place for planting/seed starting info is to google "[insert your state here] cooperative extension services". Many cooperative extensions have Master Gardener programs which offer free gardening advice. Ah ... you make me think that spring will soon be here! In Canada, we've still got a bit of winter to get through but your photo reminds me that soon, we'll be doing the same thing. By the way, we save tomato seeds too ... it's one of the most rewarding garden experiences! I love your blog. I garden (zone 9) but I don't have nearly the energy you do. BTW, you take great photos too. Well, I live in a wee apartment, with a wee balconey. When I can, I grow flowers and herbs...a full veggie garden eludes me. HOWEVER, I must say, that anyone strong enough to do more has my vote. But..for my birthday last year I wished for an apple tree, so there is one (!) out there now and, wait, I have some raspberrie plants too! Mmmm… I’ve got to start my gardening, too. Okay, I'm back with answers to Tabitha's questions. This is quite long, and I'm running late, so please excuse me for not personally responding right now to those of you who left comments recently. I do want to extend a warm Welcome To The Farm! to Homestead Herbs, Abby, Cynthia, Gary, and Tai. Thank you all for taking the time to write. Abby, your Urban Sprouts blog is great, and I think what you are doing is absolutely wonderful! First, a few personal recommendations. For years I have been happily ordering seeds from Pinetree Garden Seeds in Maine and Baker Creek Heirloom Seeds in Missouri. Both offer top quality seeds at very reasonable prices. All Baker Creek seed orders include an extremely helpful free Planting Guide. Pinetree also sells many useful garden supplies and kitchen gadgets. If you like forums, Baker Creek hosts several interesting gardening forums at IDigMyGarden.com. And finally, Rodale's Illustrated Encyclopedia of Gardening & Landscaping Techniques is one of my favorite all around gardening books. It is available at half.com for just a few dollars. Half.com is an ebay-owned company that is a fabulous source for bargain priced new and used books. If any of you are in the U.S. and have never ordered from them before, you can email me (farmgirlfare AT gmail DOT com) your email address and I will have them email you a coupon good for $5.00 off your first order. I turned to this book many times when I first started gardening, and I still use it as a general reference. It has lots of information on seed starting and even offers plans for building your own lighted plant rack. Yes, I now make my own. There are two schools of thought concerning seed starting mixes. Here's what Rodale's Illustrated Encyclopedia has to say on the matter: "Some gardeners prefer to sow seeds in special seed-starting mediums--such as a mixture of equal parts vermiculite, sphagnum peat moss, and perlite--and then transplant the seedlings into a potting or growing mix that contains more nutrients. Others prefer to plant seeds directly in a mix that contains nutrient-rich components such as compost or commercial potting soil. If you're undecided, experiment with both methods to determine which gives you the most satisfactory results." You will often read that seeds must be started in a sterile mix (such as the one suggested above) rather than in plain old dirty soil because tiny seedlings are so susceptible to disease. For years I bought the same brand of commercial seed starting mix. It was the only one I could find that was free of chemical fertilizers. (Read the bags carefully! These days it is nearly impossible to find any seed starting mixes/potting mixtures that do not contain chemicals.) Unfortunately it also had some kind of problem because every single year my poor little tomato and pepper seedlings became stunted and purple because they suffered from a phosphorus deficiency. This year I read about an interesting new seed starting mix from Garden's Alive!, a great mail-order company that sells all kinds of natural products for the garden. It is called Natural Beginnings, and here's what they have to say about it: "Natural Beginnings seed starting mix is soil-less and based on coir, the short fiber from coconuts. Because coir is porous, it allows air to circulate, reducing the incidence of root diseases. Compared to peat moss, coir retains more moisture and nutrients and is easier to keep wet. Coir lasts up to four times as long as peat and can be reused several times for successive sowings. Our tests show that seeds started in Natural Beginnings: sprout much faster, have a higher germination rate than seeds started in the leading commercial mixtures, and grow stronger and healthier. In addition to coir, Natural Beginnings contains worm castings and mealworm guano as natural nutrient sources; the castings also enhance aeration and water retention." I haven't tried it, and I don't usually recommend things I haven't used myself, but I have been happy with other Gardens Alive products I have ordered in the past. The stuff is not cheap, but if you are only starting a few types of seeds, this sounds like a good way to go. (An easy way to rationalize spending money in the garden is to compare the cost to purchasing food. For example, you can buy a package of 700 lettuce seeds for about the cost of one head of organic lettuce on sale.) If anyone tries it, I'd love to hear what you think. The Gardens Alive! free catalog contains a very useful 22-page pest and plant disease guide. I finally convinced myself that it was okay to start seeds in a non-sterile medium. I mean, all direct seeds are started out in the dirty dirt, right? This year I used a mixture of homemade compost and purchased sphagnum peat moss. I also added kelp meal and rock powders (calcium sulfate and rock phosphate). Kelp meal is an excellent thing to have around. Besides using it in the garden, I feed it to all the critters on the farm (from the cats to the chickens). It is wonderful stuff. Before my local natural fertilizer dealer started carrying kelp, I ordered Seal Life Kelp Meal For Animals in 50 pound bags from North American Kelp in Maine. They also sell Sea Life Kelp Meal Soil Conditioner. (I think they are actually the same thing with different names) and other kelp products. Shipping for one 50-pound bag to Missouri is about $20.00, but this is still an excellent price for top quality kelp. I've seen one and two pound packages selling for $14.00. Don't need 50 pounds? Consider splitting a bag with a gardening pal or two. The same goes for rock powders, diatomaceous earth, etc. Prices are much, much lower when you buy larger quantities. "In addition to requiring a soil medium and water to grow, seeds also require warmth and light. A warm spot in the house, such as on top of the refrigerator, will provide the heat. Once the seedlings have emerged, light becomes extremely important. A sunny windowsill may have to suffice (remember to turn the seed trays every other day), but ideally a pair of low-cost fluorescent shop lights should be suspended on chains about 2 to 4 inches above the growing tops of the seedlings. Turn the light on for up to 16 hours per day and then let the plants rest during 8 hours of darkness. Keep the seedlings warm during the day hours (70 degrees F) and reduce the termperature to 60 degrees F at night. Lightly water when the soil feels dry to the touch using water at room temperature. Check often as in heated indoor conditions soil mix dries out quickly." Farmgirl your lovely rack of seeds looks so organised. I am about to start mine off next weekend - the temperature here in England is not much warmer than for you, it seems. At the moment I am still digging! The ever-present task on my allotment. But I know what you mean about the optimism of sowing seeds; there suddenly seems to be no time between pushign the seed into the pot, and eating the tomato. Thank you so much for your advice and suggestions!! Wonderful! I had made my own seed starter soil, but I believe its still too heavy. I used some purchased compost I had left over. I'll give the seeds a few weeks, and if they don't germinate, we'll start another batch! i am looking into the kelp feed for my Jersey. i have heard it is good but had not found a source yet. she is due any minute! I started my seeds yesterday too. Tomato, eggplant, and jalapeno from seeds that I saved from last year's plants. Asparagus from purchased seeds, as I have yet to try my hand at growing them. Wish me luck (and patience)for asparagus spears in 3 years time! A definite sign that spring is on the horizon. Guess what? I forgot to tell you--the new house has a Florida room with 3 skylights. Do you think placing my seedlings (when they appear) directly under the skylights on a table will suffice? The sun is pretty strong here, even in winter. Very cool. I am seriously thinking about summer, but have not planted any seeds yet. The only thing I have done so far is mental work. I've been stymied by cilantro, but midwinter I hit on the idea of trying to grow it on the west side of my house among some flowers, where it's shady part of the day. You're very welcome. Yes, something I forgot to mention is that seed starting mix really needs to be lightweight--which is why you don't want to use straight potting soil or even garden soil--it packs down too easily. Basically what you want is something that is free draining yet holds several times its weight in water. The peat moss I add to my compost helps to lighten it up (and I think I need to add even more than I did for this batch of seeds). Baker Creek recommends a mix of 50% peat moss and 50% vermiculite. It was my pleasure. Glad you found the info useful--and great to hear you buy seeds from Baker Creek. I've ordered from Johnny's in the past, and they, too, have excellent seeds. Another wonderful organization is the Seed Savers Exchange, though I haven't actually ordered seeds from them. Oh, skylights--fabulous. You could certainly try putting your sprouted seedlings under the skylights. You'll know right away if the light is too far away, as your seedlings will quickly become "leggy" as they reach higher and higher for the light they need. In your temperate Florida climate, though, you could probably just put them outside, at least during the day. And bring them in (or cover them up) at night. Have fun! I love cilantro but have given up growing it. I had to force myself not to order yet another packet of cilantro seeds the other day. It just does not like even the slightest hint of warm weather. I have had volunteer cilantro plants coming up in the snow. That's when I figured out that I was never going to harvest cilantro and tomatoes at the same time in Missouri. Your idea sounds like it might work. This year I also saw a few places offering "slow to bolt" cilantro. Might give it a try. Let me know how it goes! Thanks again to all of your for taking the time to write. Obviously there is more to starting seeds than what I've covered here, but I wanted to share some of the things that I know work for me. For more information, I again recommend The Vegetable Gardener's Bible (link on the main post) and Rodale's Illustrated Encyclopedia of Gardening & Landscaping Techniques (info & link in my earlier comment). I also discovered today that Gardens Alive! (a great company I mentioned in my earlier comment) has a handy seed starting guide on their website (click here) as well as all kinds of other helpful information for organic gardeners. I have a question for you. About how much time do you spend working at/in the garden? I had a garden years ago but haven't done it in a while and I'm afraid I've gotten too busy with other things to actually be able to produce anything. Also, do you use anything (mesh, fence) to keep out critters? Welcome to the farm! I apologize for not getting back to you sooner. Hmmmm. How much time do I spend working in/at the garden? Well, of course it depends on the season. When I had a larger garden (22 plots that were each 7'x22'), at the height of summer I once estimated that I was spending 25+ hours a week working in it. That's a lot of time! I now have a slightly smaller garden and use raise beds which helps cut down on work. You could plant a very productive garden in a small area and really not have to do much work at all once everything is growing. The most important thing I do in my garden is mulch. I usually use soiled bedding hay I muck out of the sheep barn (which also acts as a slow release natural fertilizer on the plants), but any kind of mulch will save you tons of time because mulching means NO WEEDS! Another large chunk of garden time is taken up in the summer by watering. We don't get sufficient, timely rainfall, and I've found that standing out there with a hose is actually the most efficent way to water. This does take some time. Again, if your garden is small, it may only take a few minutes a day. You can also cut down work time if you are willing to invest a little money. For example, an irrigation system, or simply a few soaker hoses you can move around. You can also buy rolls of this black stuff (sorry, actual name is completely escaping me right now) that you can use to block out weeds. It works best in plots where you have larger plants, such as tomatoes and squash because the way it works is you cover the ground with this stuff, then cut small holes in it and stick the plants into the ground through the holes. Instant weedless garden! But obviously this wouldn't work where you direct seed things like lettuce or turnips or beans or whatever. In general, many vegetables are very low maintenance. Put a cage around a tomato plant when it is very small and besides watering and fertilizing (I recommend natural fertilizers such as manure, compost, manure or compost tea, kelp, etc.) there is really no other work required. Same with bush beans. Plant the seeds in rows, mulch with grass clippings or whatever when they emerge, and wait for the beans to mature. As far as critters, that is a neverending battle here, though I know many people have it much worse than I do (we don't have gophers). Right now there is something literally digging up areas by the square foot in the garden. My first guess is an armadillo. They are a terrible nuisance. Last year I found a possum in my strawberry bed, and of course, there are the strawberry loving turtles. We also have rabbits and god knows what else. Oh, moles. They are awful. Did you know one mole can dig 160 feet in a night? That's a lot of messed up garden. Except for maybe building a 6-foot high stone wall around the garden (wouldn't that be lovely, though! ), it's pretty impossible to keep little critters out. They can get through practically anything if they are determined to dine on your dahlias. Last year I demanded a dog-proof fence around the garden for my birthday because, although the dogs are good at scaring off marauding critters, they were also doing their own digging damage. Of course the dogs can still get in, but they don't go in as much--and I never catch Robin nesting on my nice mulched beds anymore. And the dogs definitely keep the deer (who would be able to jump over even that 6-foot high stone wall) out of the garden. hello, farmgirl, haven't been here in a while, and i haven't started my seeds yet! (thank you for the reminder!) love all your tips and instructions. i do have a suggestion for those who are just beginning gardening -- last year i took a leap of faith and started winter-sowing -- yup, in the middle of the winter, in december! you can visit the winter-sowing forum at gardenweb.com to learn more -- lots of helpful people there, including the gal who "invented" winter-sowing, trudy. no warm environment needed, no greenhouse, no expensive setup for watering indoors or grow lights. i was *inundated* with growing plants and herbs last year and couldn't begin to tell you how much money i saved just by doing it. i also trade seeds at the seed exchange forum -- wonderful people there and again, lots of savings for budget-conscious wanna be gardeners/farmers. will be stopping by here again to see how your garden is growing! Great to hear from you. And thanks for all the wonderful info! I am going to start seeding in a couple of weeks, but I was told not to do it until the full moon in mid-March . . .any opinions on that theory? Also, I have a worm compost in my apartment and plan ot use the soil from that to start my seeds - what should I mix with it that I can actually find this time of year? I am a new to gardening. A friend of mine gave me some seeds from a zucchini he stuffed last year. I planted a few of the seeds and ended up with a nice looking plant. The leaves and stems were giant compared to other zucchini plants and the vegetable it produce looked kind of like a giant prehistoric frog? The vegetables were so ugly we could'nt bear to cook them, let alone eat them. We ended up throwing them in our compost pile. Months later they still hadn't broke down so I chopped them up more with a spade. That didn't work either so I buried a few feet deeper in the compost pile. Soon a strange odor permeated the backyard and eventually the neighbors began complaining of the stench. I ended up having to call the fire department to remove it, because the smell got so rank that we couldn't stand it. I used to be able to get earthworms for fishing out of my compost pile but now they are all gone and it still stinks back there? Wow. That is weird. Really weird. Kinda creepy, too. I have no idea what's going on--or what to say. I can't imagine any kind of squash making that much of a stench. If the stinky stuff didn't actually kill the worms in your compost pile, it may have driven them away to a more hospitable spot. I hope this experience doesn't turn you off gardening forever!